Greetings, and welcome to my web site. My name is Russ Flaum, and I am a born again photographer. Like many others in my age group, I spent years taking 35 mm slide photos of my family and friends. When digital cameras came on the market, I bought and used a point and shoot model, and began the long and ever changing task of learning to use the computer to“develop” the images. 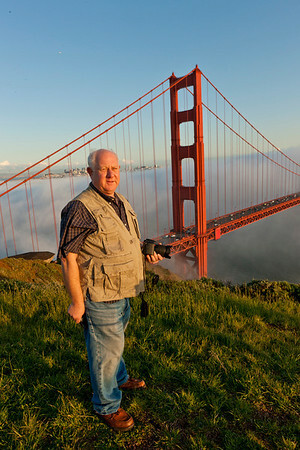 In 2007 I joined the Marin Photography Club, and my life has not been the same since. Camera wise, I moved up from the point and shoot camera to a D60 Nikon digital SLR, and when that did not give me the photographic options I wanted, I traded that camera for the Nikon D90. Like many others, I follow the trends and added the Nikon D800 full frame and now a D500 C sensor for Nature Photography. I also have a Sony A6000 mirrorless camera for Street Photography. Photographically, I am now a serious amateur photographer who is dedicated to learning all I can about my cameras and lenses, how best to take all kinds of images, how to post processing the images in the computer, and how to share my photographs with others. I am an active member of the Marin Photography Club where I continually learn from my fellow photographers, as well as from the Club’s guest competition judges and educational speakers. Each month I compete in the Club’s print and digital competitions. In and out of the Club, I especially enjoy traveling and going on photo field trips with my friends and fellow photographers. I am pleased to share some of my photographs with you. If you have questions or comments, please contact me. Your feedback is most welcome.